Young woman standing on the top of breaker DC-3 plane in Iceland. Female exploring deserted black beach alone. Freedom: back view of young woman in lopapeysa standing on the top of breaker DC-3 BMC plane on black beach in Iceland. 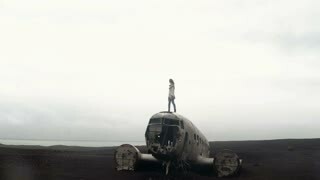 Young traveling woman standing on the top of breaker DC-3 BMC plane on the black beach in Iceland. Hair waves on wind. Young traveling woman walking alone on the black beach near the breaker DC-3 BMC plane in Iceland in windy day.